Share with your Classmates on Social Media! Sign Up or Renew your Chapter Membership. Members receive access to "Members Only" content and discounts on Chapter Events. Members receive access to "Members Only Content" on this website, which includes Houston Chapter Members Directory, exclusive company-direct job postings, industry events postings, and more! Funds collected from annual dues go directly towards Midshipmen in the Houston / SW Texas area. Pays for all Midshipmen attendance at the Texas Christmas Joint-Service Military Academies' Ball. Sponsor (2) USMMA Midshipmen attendance and registration at the annual Offshore Technology Conference in May. 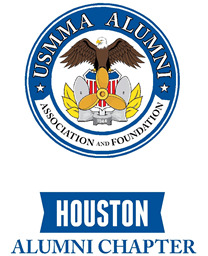 Represent USMMA at College Fair events and Military Academy Information nights in Houston and surrounding areas. Fundraising and support for Blue and Gray Tournament/ USMMA Athletics. Sponsor annual Plebe Send Off Luncheon with South Texas Parent's Assn to welcome new incoming class of Midshipmen and send them off well prepared for Indoctrination. Sponsor Midshipmen for internships at local maritime companies. Provide Midshipmen berthing throughout the year. Arrange and support Texas Midshipmen events on campus by directly coordinating with Parents and Educational Staff. Host USMMA AAF meetings and awards in local area. Photos from Houston Chapter events!